Location: Montdardier, in the Gard departement of France (Languedoc-Roussillon Region). 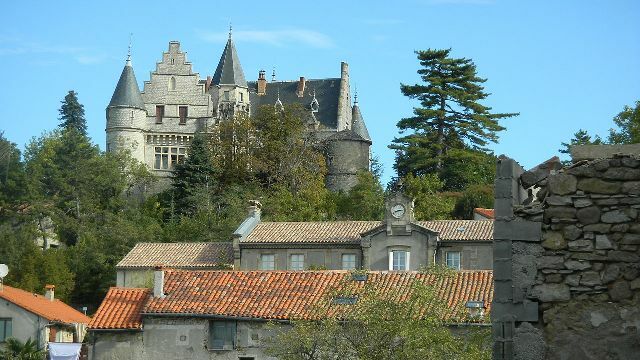 Notes: Château de Montdardier is located in the municipality of Montdardier, Gard, 9 km from Vigan. The fortress built in the twelfth century was repeatedly demolished and restored in 1860 by Viollet-le-Chateau Duc.Le Montdardier been a registration as a historic monument since February 20, 1989 The terroir of Montdardier was first mentioned in 1099 in the cartulary of the abbey of Saint-Guilhem-le-Desert. It seems that the castle or the original guardhouse was not located at the site of the present castle but between the village, the hamlet of Sanguinède and mas de la Gardie, the place has also kept the name of " castel viel ".Construction of the castle is in the movement of building medieval castles. In this type of organization, characteristic of the twelfth century, the castle occupies the summit of a mountain or hill and the village moved nearby to benefit from its protection.